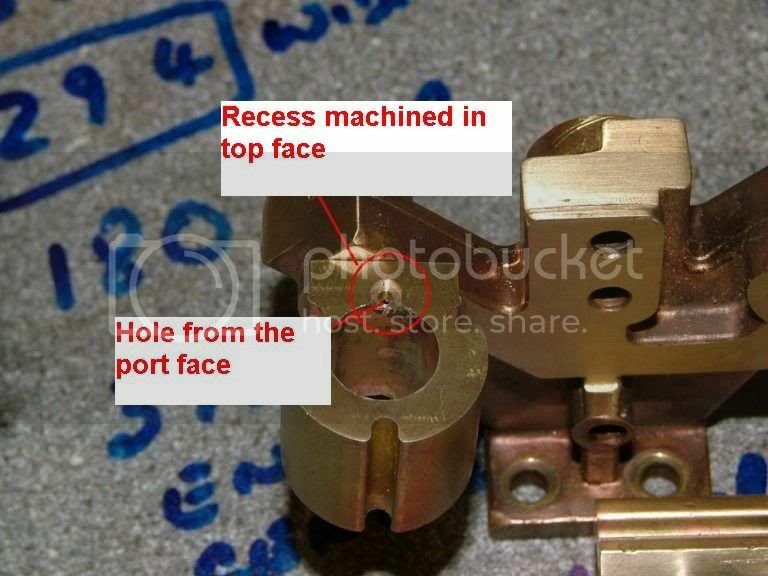 This is another post that I did a while ago, and it is rather long, but if you have ever made a machining mistake on a casting, then reading through this just might give you a few ideas on how to put things right. This was sent to me. The customer said that he had made it, and it just would not run. It was supposed to be a Stuart Turner twin oscillator. As soon as I stripped it down, I recognised the age old problem. 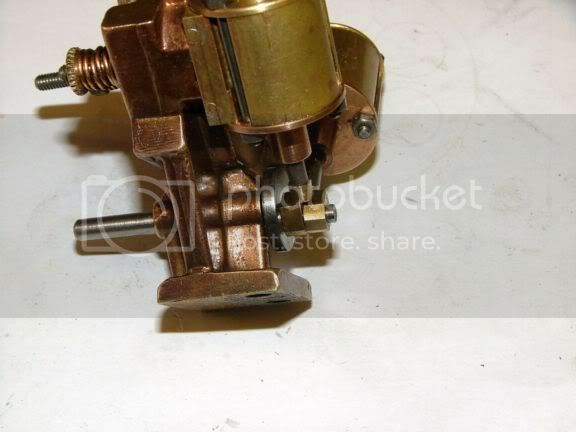 Because the porting was in the wrong position, when he turned it over, instead of having a nice open to air running, it was building up pressure inside the cylinders, and putting heavy forces on the engine as it was being turned over. So effectively he has worn the engine out before it would even run by itself. It isn't a major issue for me, everything can easily be rescued, in fact in the top right, I have already started on a new crank. But for the beginner, this engine would have to be scrapped. I thought I would show the members how I go about rescuing an engine that should really have been consigned to the recycle box. 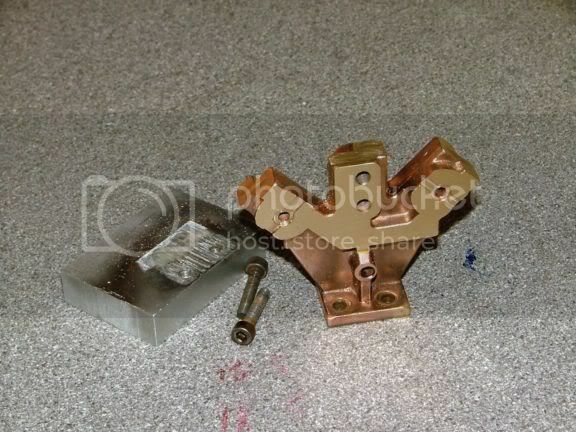 After finding out that the machined port faces were square to the base bottom, I made up a quickie ali plate, with two parallel faces so that is could be remounted accurately into the vice after a little work was carried out on the casting. Once the ali plate was tapped down onto a parallel, I levelled the port faces and tightened it to the plate when I had it running 0-0 along the parallel I was measuring against. 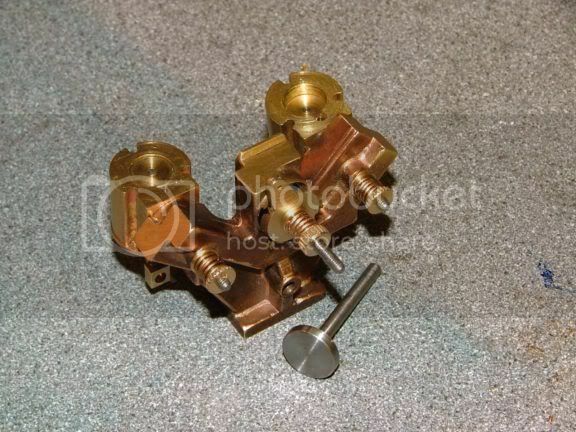 I was very surprised to find out that the casting is in fact brass, rather than the normal bronze. It must be that ST are cutting back on quality even further. They can't get much worse than the crap undersized cast iron castings that they are knocking out nowadays. Anyway, getting away from my personal gripe, I roughly centred a 1/8" (3.2mm) endmill over each port hole and cut down to a depth of 50 thou (1.25mm). 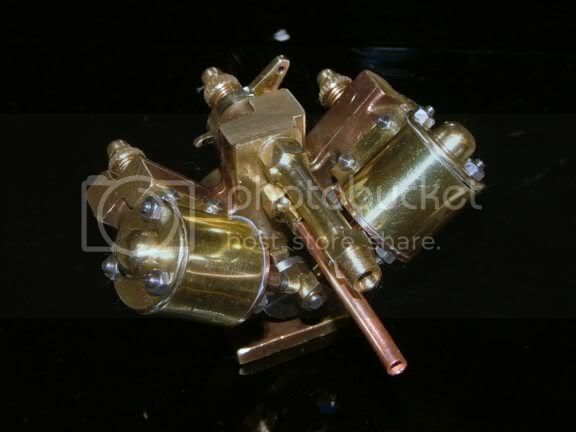 Once all eight ports were machined out, I made some slugs of brass to fit in each hole. A bit of flux (I am trying a new one and don't know what it will turn out like, it is Tenacity#5, supposedly even better than my favoured 4A) down the hole, a plug inserted, and a small ring of easiflo 0.5mm wire around each one. A bit of heat until the solder flows, then a quick quench followed by half an hour in a citric acid pickle bath. I did notice that the new flux was still very active while the job was heating up, also I noticed that there was a lot more copper plating from the pickle bath than I would normally find. It looks like the whole casting is made of copper, whereas normally, there would be just areas around the soldering that were copper plated. After a good dose of surface grinding and a little bit of mill work, the casting is ready again to be machined, this time with the holes in the correct place. I did remove a few thou of casting thickness, but there is still plenty of meat on it to take it. The new port holes won't be as deep as the originals, as I will only be penetrating the slugs and picking up on the oversized and out of place holes that were in there before. I did no more work on the crankshaft, as I need to get the cylinders into their correct positions first. I will eventually mod the crank disc thickness to take into account the thickness I have removed off the casting, only then can the crank pin be fitted. When silver soldering, there should always be a gap of around 0.002" (0.05mm). 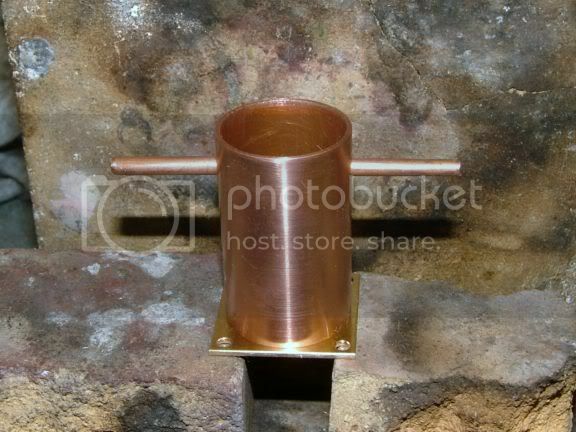 This is to allow the silver solder to flow under capillary action into the gap and make a super strong joint. 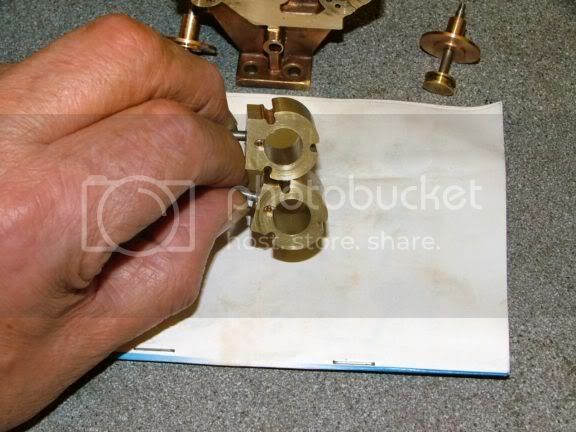 The mistake a lot of people make is to have the bits press fitted into the hole. 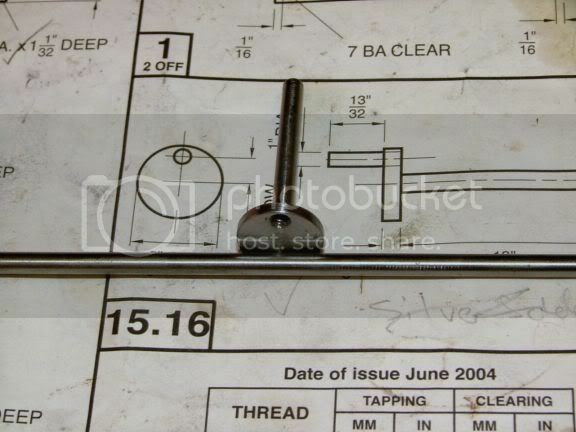 Then when it is silver soldered, the solder only sits on the surface. 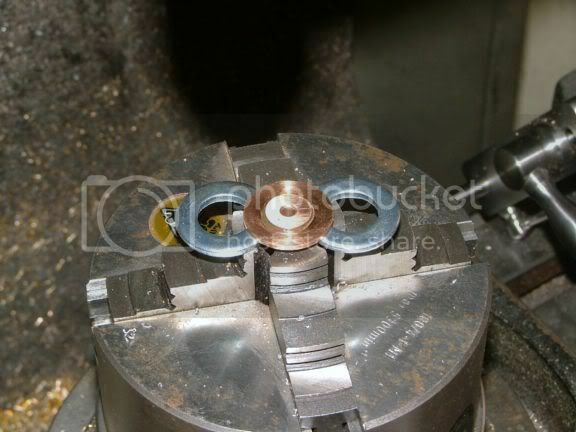 When you come to do a bit of machining as I have done, the slugs would then not be fixed in position, and liable to be blown out when pressure is applied. I have been rescuing these sorts of engines and castings for many years, so to me it is just another little job. 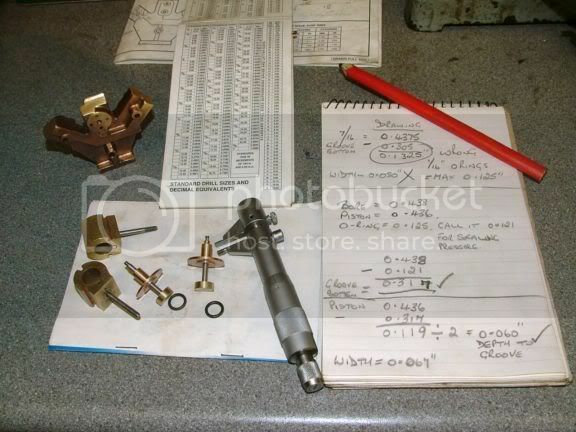 you tend to remember how you have repaired bits in the past, so no learning curve to go through each time. Excluding the pickling stage, this was less than an hours work, so well worth doing, considering a new casting would be about 35 to 40 squid. Very rarely do you come across a casting that can't be repaired and got back into a usable state. A coat of paint also helps in covering up a repair if it can't be blended in too well, as would happen with a silver solder repair on a cast iron casting. Using my coaxial indicator, I centred up the RT to the quill. 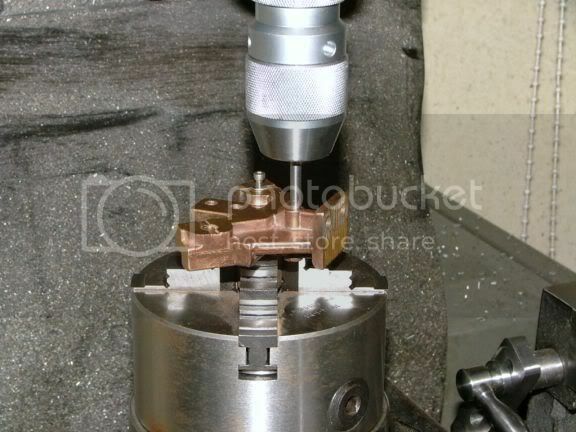 Having previously turned up a holding mandrel on the lathe, and without taking it out of the chuck, the chuck was unscrewed off the lathe, and screwed onto the matching thread on the RT. This put the mandrel on the centreline of the quill. 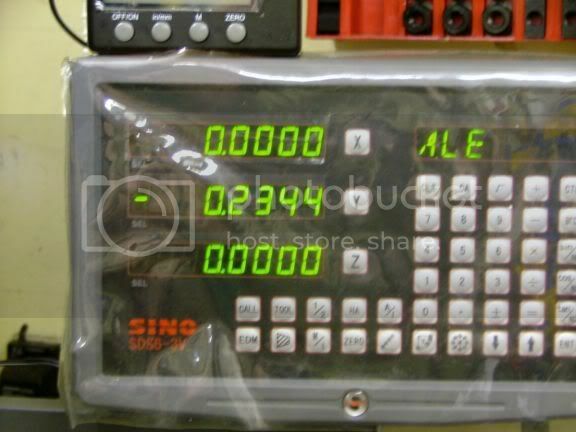 The RT was set to zero on it's angle scale, and the machine DRO was zeroed up all round. This is showing it in metric, just after this, I reset it to read imperial, as that is what the drawing calls for. 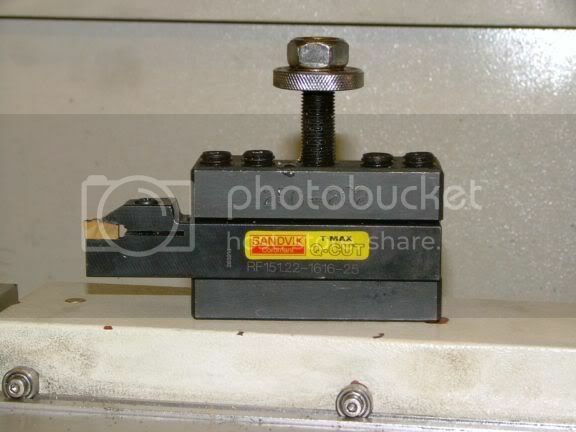 The X axis on the mill was locked up, as all movement for this operation will be done on the mill Y axis and the RT degree scale. The casting was dropped onto the mandrel but it was not tightened down, yet. 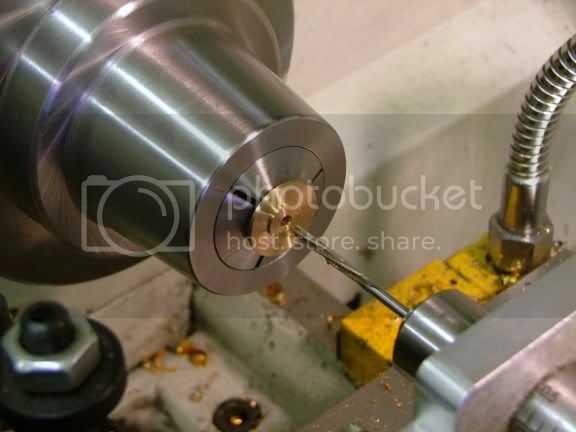 This is the method I use to make sure that the holes are drilled perfectly in the correct position around the cylinder pivot, even though the pivot centre and the crank centre might be slightly out. 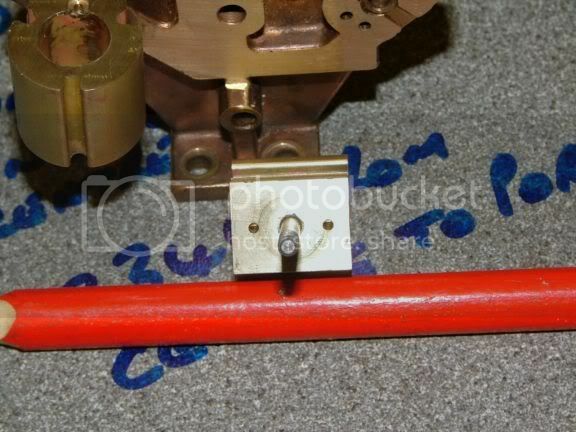 This will automatically ensure that when the cylinder swings from side to side, even if the centres are slightly out, the holes will line up perfectly with the ports in the cylinder (assuming the holes in the cylinder are on the centre line, which on this engine, they are). This shot is taken slightly from the side to show what is going on. 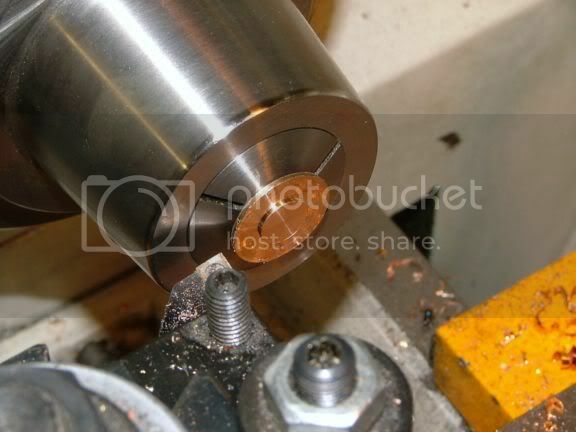 I mounted up a bit of rod, the same diameter as the crank hole into the chuck. By moving forwards on the Y axis only, disregarding what the readings were, I moved it forwards until the rod slipped nicely down the crank hole. Then I tightened up the screw to lock the casting onto the mandrel. So now I had the two centres perfectly aligned down the Y axis. 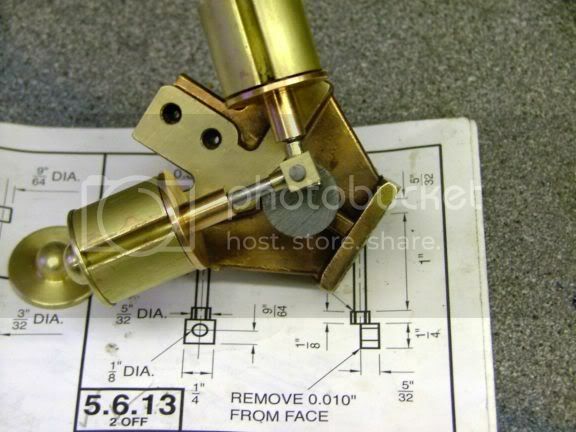 The rod was withdrawn, and the Y axis was wound back to the zero position. 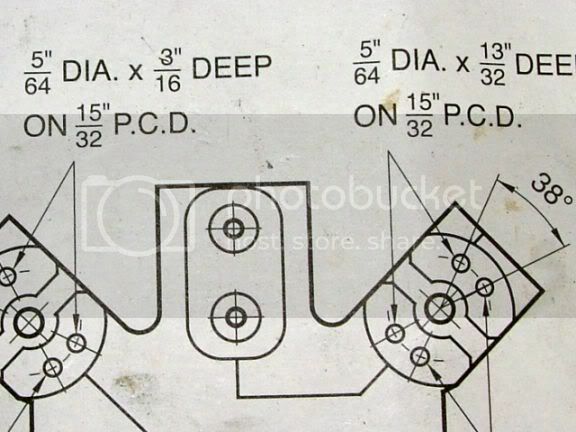 This is what is required on the drawing. 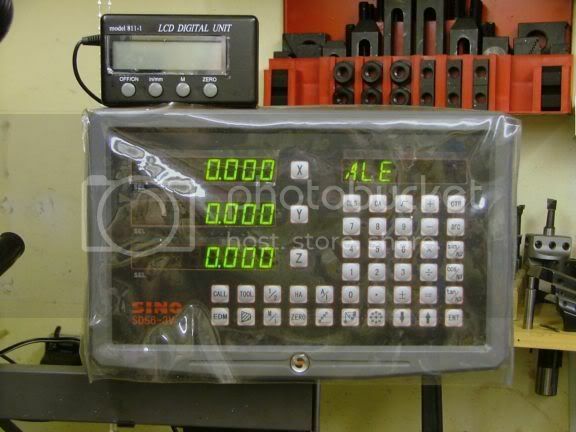 The PCD is 15/32", so that was halved, giving 15/64", and the Y axis moved forwards by that amount. As shown on the DRO. The Y axis was then locked up. All work now is using the RT and the quill. As can be seen from the drawing, there is a spread of 38 degs between the port hole centres. That means 19 degs either side of the centre line. So a quick calculation gave me settings for the RT. 19, 161, 199 and 341 degs. 19 degrees either side of the 0/180 deg centre line. A quickie centre drill at those setings, followed by drilling down thru the silver soldered plugs, until the correct sized drill hit the previously drilled ports. Once one side was done, the same thing was done on the other cylinder pivot point by repeating the exercise. I took this shot on an angle to show how the new holes join up with the previously drilled out of position holes. It doesn't matter that they are not quite in line, the steam will find its way thru. The main thing is that the holes on the surface bearing face are in the correct position now. I will wait until I have finished the bottom bearings of the cylinder before deciding what to do with the pistons and rods. 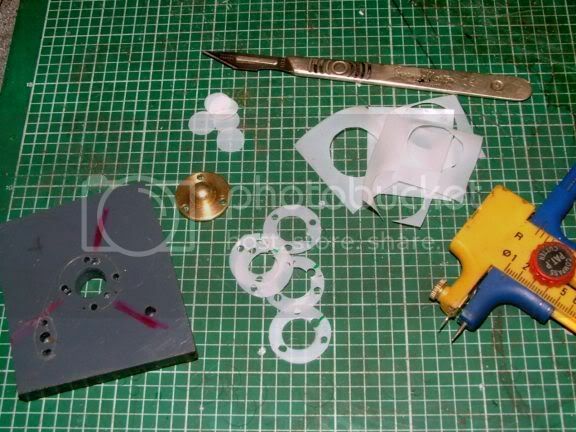 But just to make sure, I gathered the bits together to make sure I could make new of everything if required. This is a lump of PB2, a little more difficult to machine than PB1, but it was the correct size for the job. So armed with a razor sharp HSS tool, I wacked off the metal until the bearing spigot was at the correct size. Now this is where a benefactor comes onto the scene. Look what he dropped off. I have been contemplating buying one of these for a few years, but never got around to it. WOW, it went thru that tough bronze as though it wasn't there. 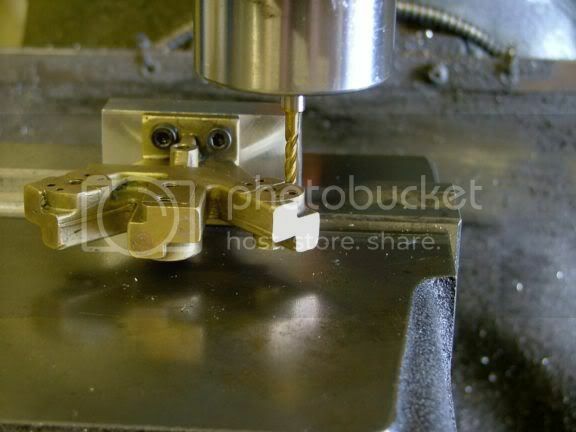 It works on the principle of deforming the chip as it comes off the cut, so stopping it jamming around the tool tip. You can see the swarf on the crosslide, it just curls it up in two dimensions, and throws it out. 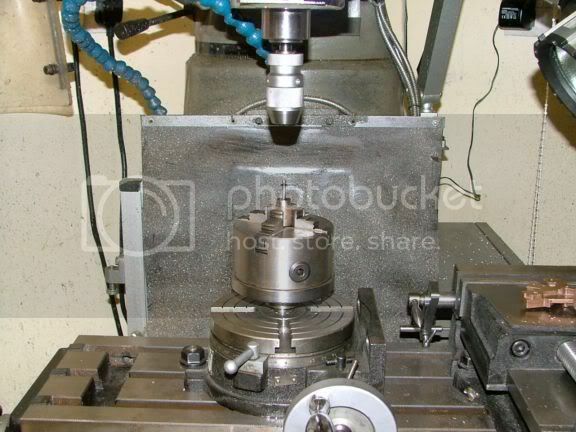 Unfortunately this tip holder can only go deep enough for a 7/8" bar, so I will look around for a longer nosed one that will cope with larger diameter bars, now I know what a wonderful system it is. The first one ready for the next stage. Soon followed by it's twin. Now comes the stage where people make their main mistake. 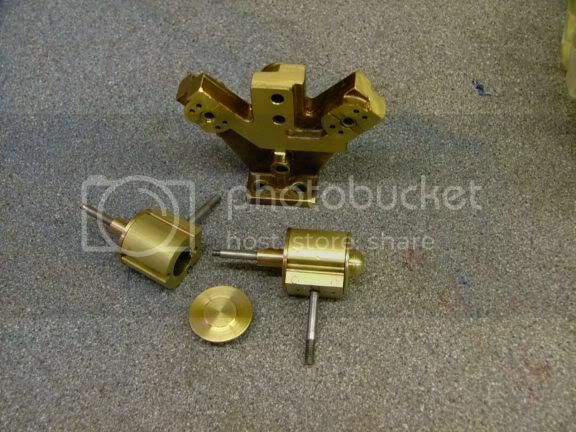 They do one component machining operation, then do the next component, then go back and drill and ream holes. You must finish off each component separately to it's conclusion, only then change over the component and carry out the same ops. 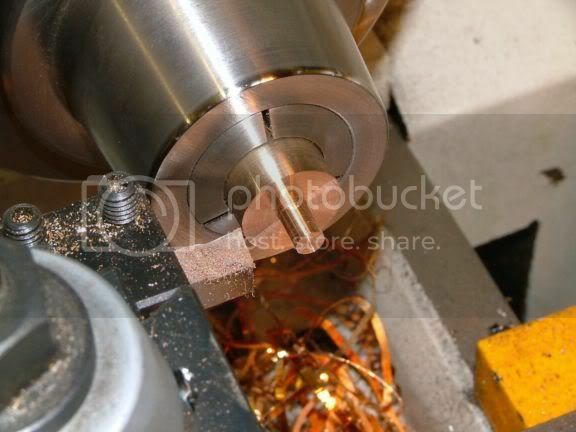 The first op is to machine the spigot for a wringing fit into the bore. 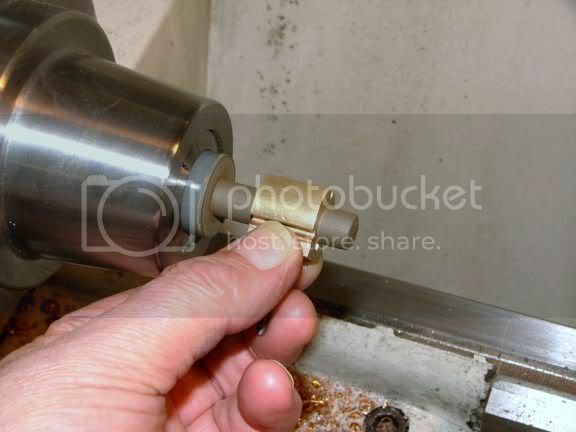 Then drill and ream, or bore for your finished sized hole. 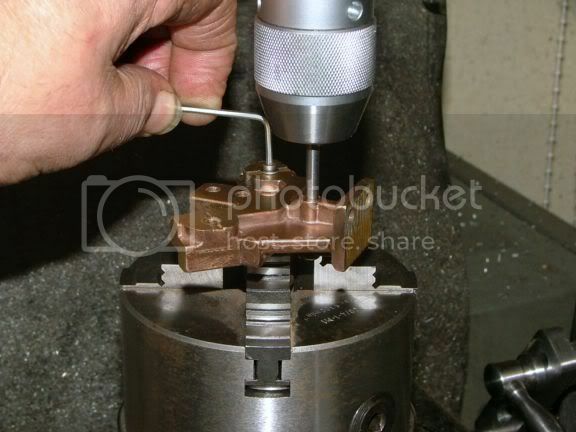 By doing it this way, it will ensure that the hole is truly concentric with the bore. Only then do you swap over and do the next piece. 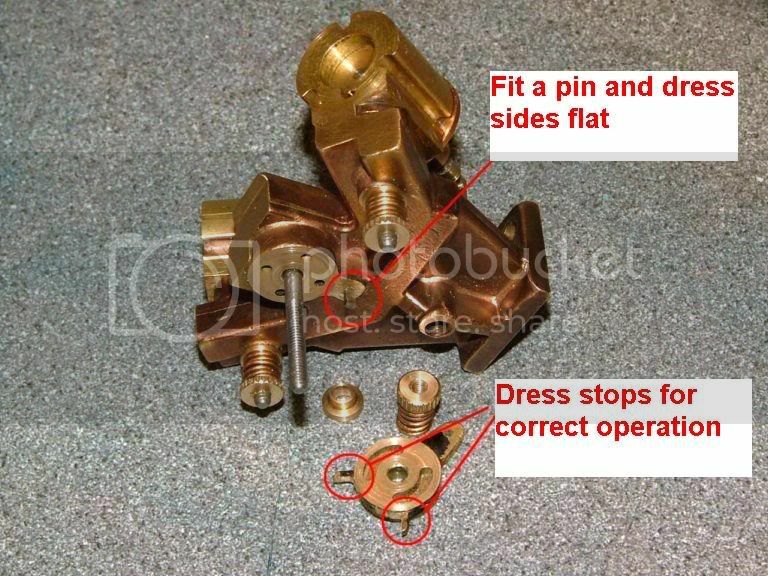 The outside shape has nothing to do with the well running of the engine, this spigot and concentric related hole is the bit that needs to be spot on. 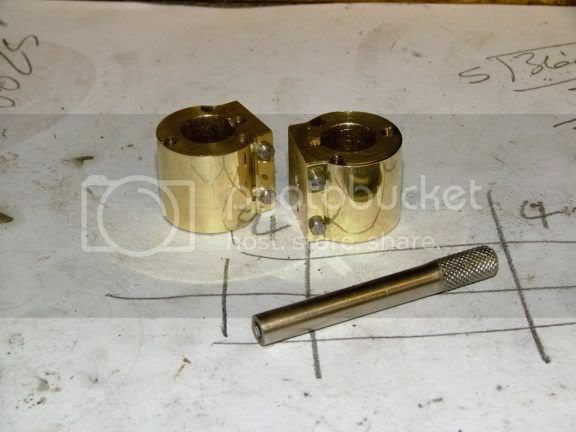 Once the two bearings were done, it was found that the pistons and the rod ran perfectly in the bores, so I decided just to make new pistons which were a little small on diameter, and will be made at a future machining spell. Getting away from the pistons and end caps now, notice how close the holes are to the port faces. 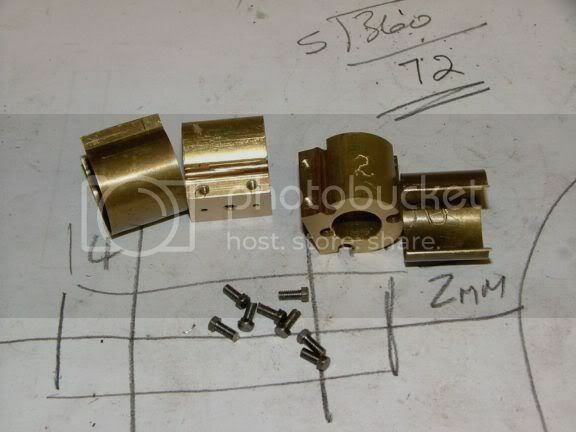 I think that the cylinder covers were fitted first, then the port faces were machined down a little too much. 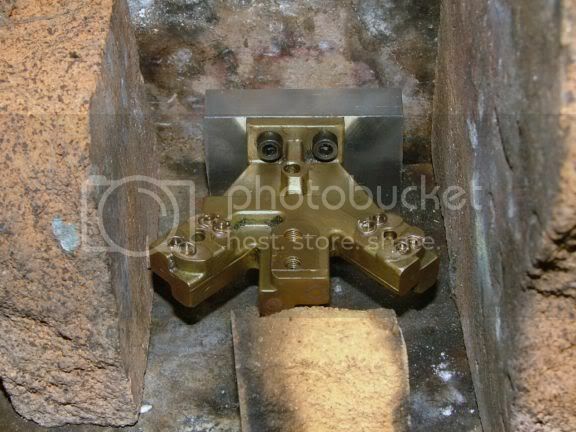 To such an extent, that the brass screws that held the covers had almost half the heads machined away. I can see another fix coming on. 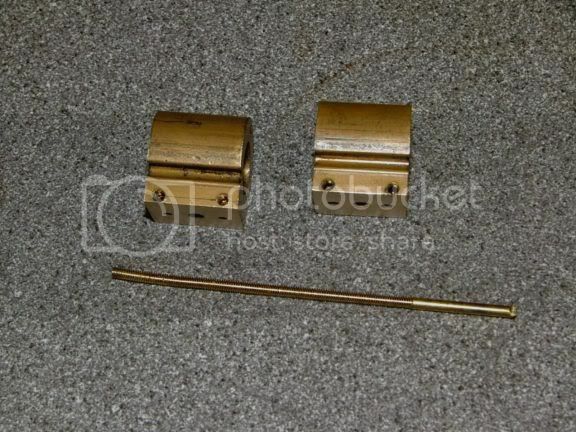 Grab a bit of brass rod on nearly the right size for 7BA. Then a quick and dirty exercise to make a length of threaded rod. 30 seconds work to cut a length of thread about 3" (75mm) long using the die holder off the lathe and a rechargeable drill. I wasn't too worried about the quality of the thread, as long as it screwed into the holes. 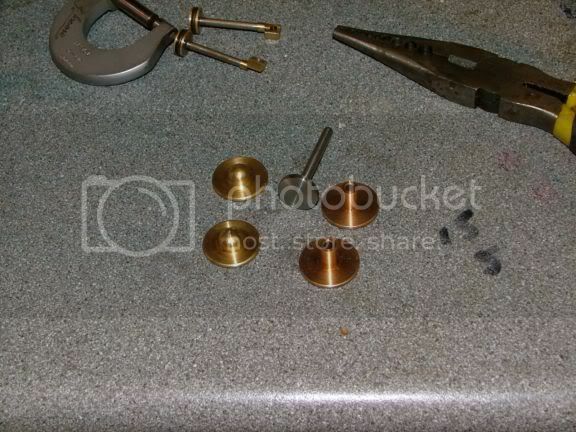 Like the repair to the main casting, bits of rod were screwed into the holes after first dipping them in flux. Then they were silver soldered into position, using the same method as use on the main casting. 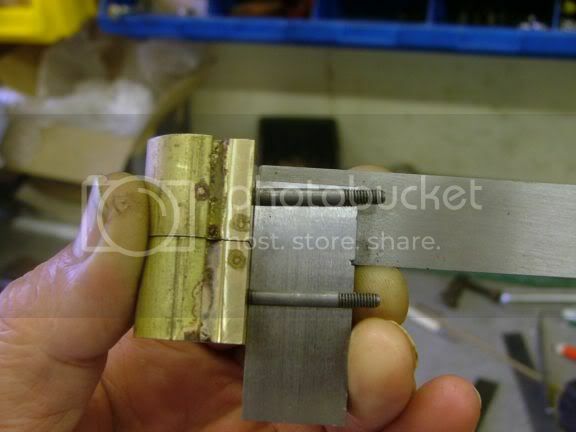 A quickie machining job and the cylinder was back to square one, ready to be drilled in a better position. 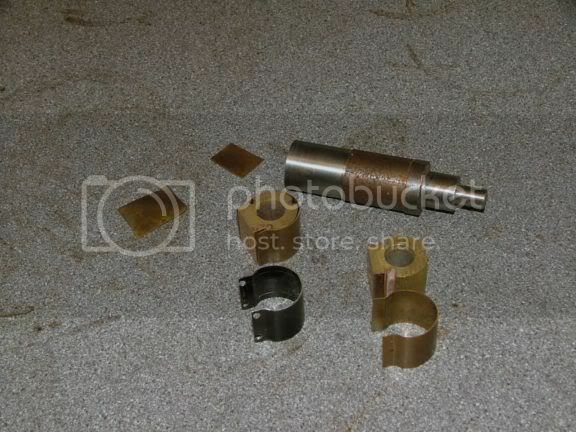 The problem now was that I had steel cylinder covers with holes in the wrong place. 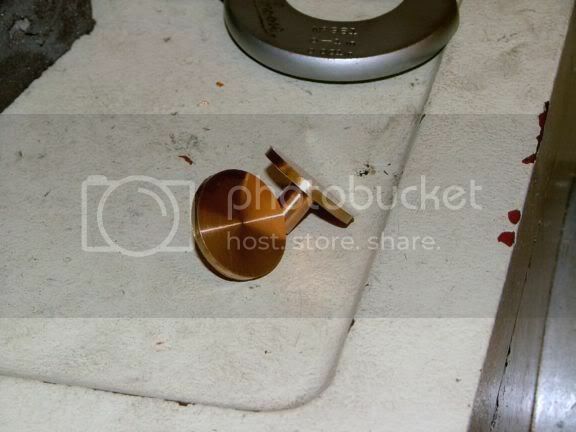 So a bit of brass plate was cut to size and annealed, a mandrel turned up to bend the brass around to get to the basic shape, then a bit of bending in the vice soon had two new brass covers made. 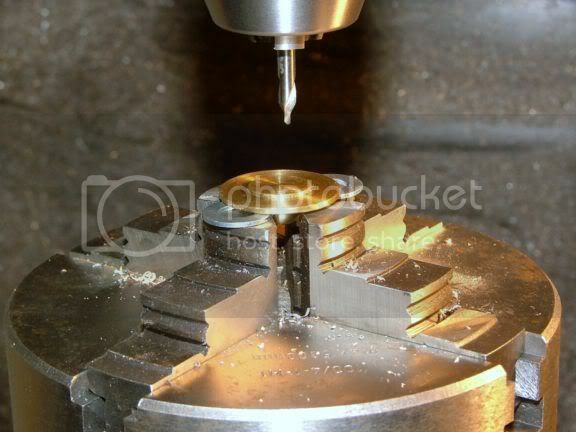 I will drill, tap and fix them in position after I have made the new pistons. As can be seen from this pic, the holes were a lot more out of kilter than I first thought. It is no wonder that the port faces weren't sitting against each other. This was just too much to try to straighten up, so there was nothing else to do other than go on one of my silver soldering binges. The port holes were out of line and too large on a couple of them, so I went the whole hog and plugged up everything there was, even the port drillings, and start from scratch. First off, make the bad holes even bigger. Stick a few bungs in there and get out the blowtorch. This is how they ended up. Just like original, with no holes, but with an extra bit of meat here and there. 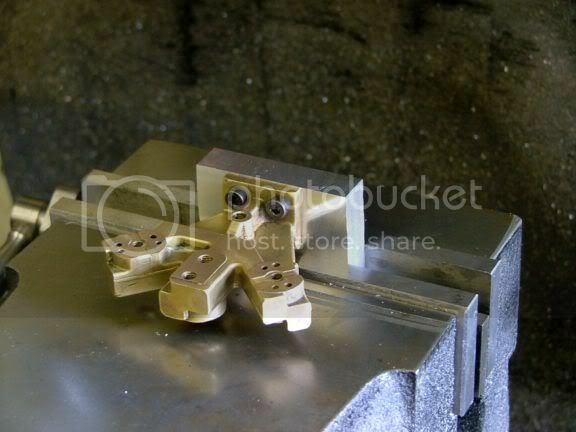 A little bit of machining soon had them looking a bit sweeter. Faced off, and all holes in their right places, and square. On the ST plans it showed the port drillings being done on an angle, from the port face to just inside the cylinder top and bottom. This engine, as far as I can ascertain, is really for the beginner to model engineering, his first build maybe. To put angled ports on such an engine is absolutely stupid. A beginner will have trouble cutting things on the flat, never mind on an angle. Even I get it wrong sometimes, and I have done a few in my time. So, I have made the port drillings how they should have been designed into an engine of this type. 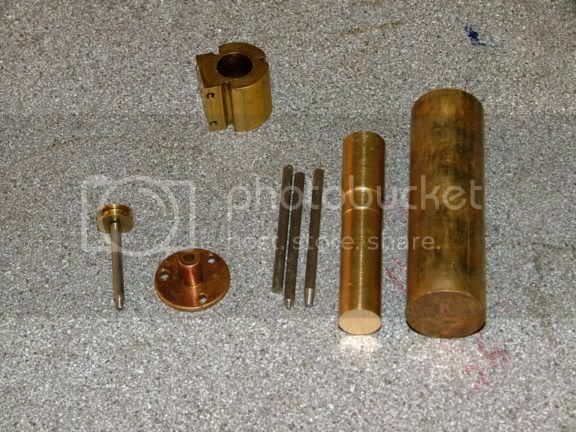 Make a recess top and bottom to allow steam to enter the cylinder, drill the ports straight in from the port face, then drill straight down until the two parts are joined. Dead easy to do, and almost guarantees success for the beginner. Because of all the hot work that has been done on these cylinders, I suspect that the bore has distorted slightly, plus any flux runoff may have eaten into the walls a little. 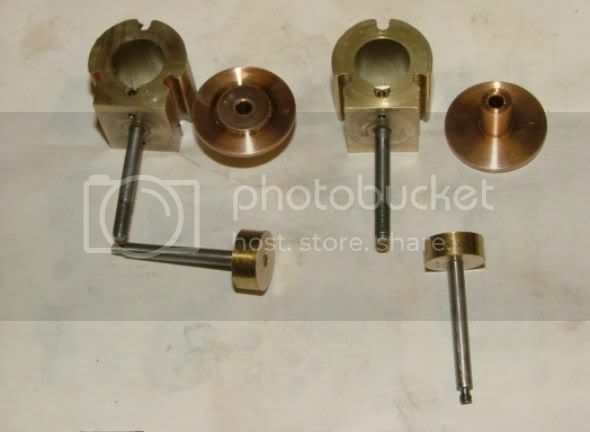 So I will make a plastic cylinder hone, and grind the bore back into shape before I make the new pistons to fit, I am only talking about a couple of tenths, so it won't really make much difference to the spigots I have turned on the bottom cylinder bearings. The purists would go ballistic if you told them to make the ports this way, super efficiency, free flow of gases and all that crap. In what we do and make and in the sort of sizes we are talking about, it makes not one iota of difference to the way the engines run, so why not design them as simple as possible to make? This is one time the engine designer has really got too big for his boots. Turning a simple design into a horror to make. I grabbed a bit of PVC rod and turned it down to about 1 thou under bore size. Then using a couple of different grades of valve grinding paste, then finishing off with a chrome cleaning liquid, I got the bores nicely cleaned up. I am not after micro finishes and sizes on these bores, as long as they are smooth and within a thou or so they will be fine. Don't go chasing your tail trying for perfection. As stated before, for an IC, flame licker or Stirling, yes, then try for the best you can. With these small engines, near enough is usually good enough. Nice semi matt bores, and both measure the same. 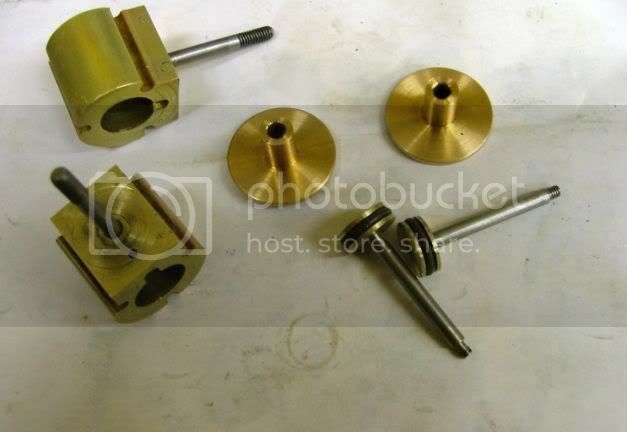 I am making new pistons, and here they are in rough size. 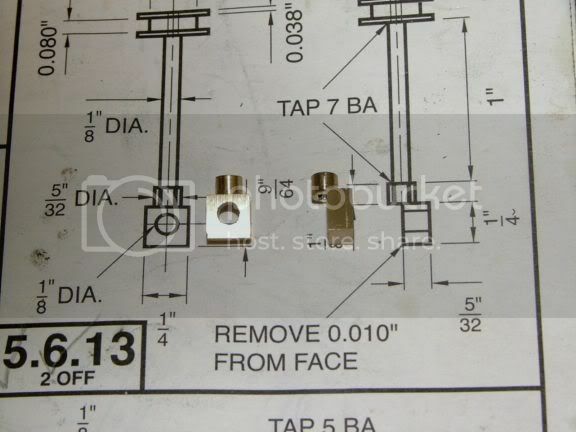 They still need to be turned down to length and diameter (0.002" or 0.05mm smaller than the bore). I have now marked each piece as part of an assembly, with either one or two tiny pop marks on each part. This will ensure that when I have finished, I will have two perfectly fitting assemblies, with all parts matched to each other. I found in my little stash, two perfect matched o-rings to the crappy ones that were in there. So I did a quick check on the plans for groove dimensions. 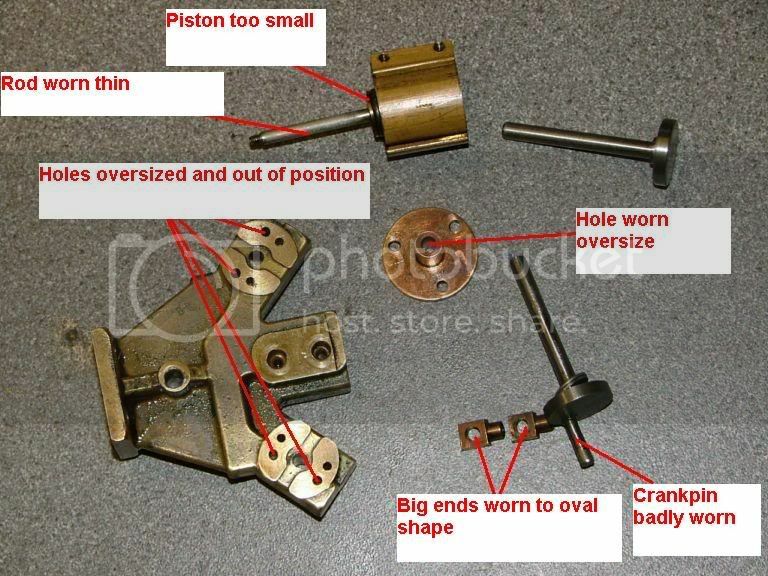 If I had made the grooves to the plans, the o-rings would have been sitting lower than the piston edges, and so performing nothing to sealing the pistons, just there for decoration. The great ST strikes again. So armed with a bit of paper and a pencil, the CORRECT dimensions were worked out. Pistons now to size, o-ring grooves and widths correct. Now V-E-R-Y happy with the piston and ring fit. They should work perfectly. 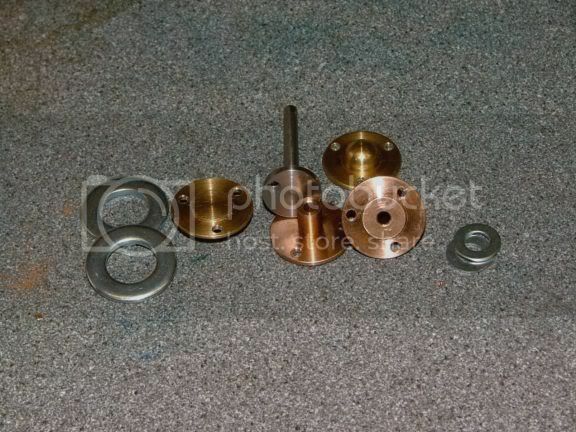 So a bit of flange drilling, and the assemblies will be ready for fitting. 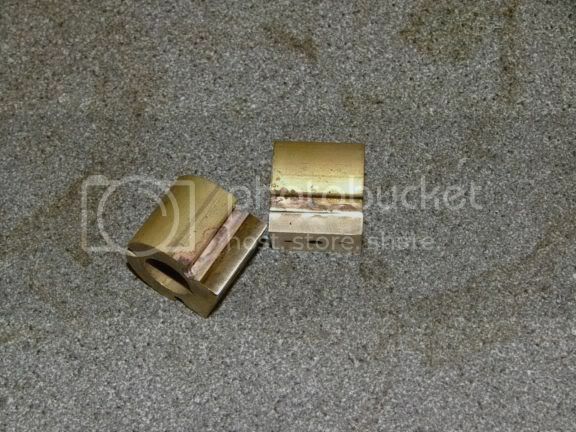 Just to tidy things up on the cylinders, I knocked up a couple of end caps out of brass. So now onto the big ends. I like the very hard wearing properties of ali bronze, so instead of phos bronze, I wacked some hex ali bronze down to the required size. It was soon into the lathe for a bit of shaping, drilling and tapping. 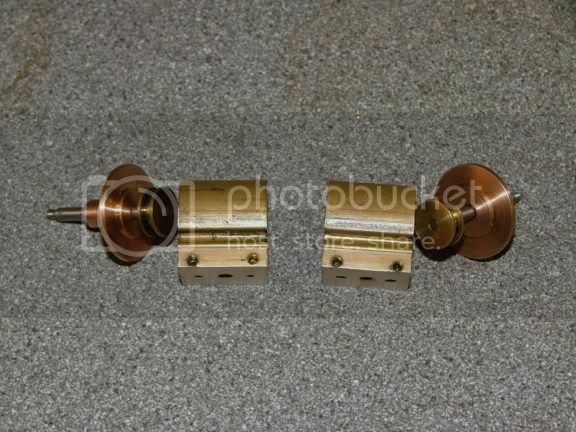 The pair were then slipped onto the mill and cut and drilled to shape. Great I thought, everything had gone smooth as silk and I had the new big ends within 5/10ths of drawing, so basically, spot on. Before I cleaned them up, I wanted to see how they fitted. Then the problem reared it's ugly head, they didn't, fit that was. As you can see, they wouldn't fit onto the crank pin. Then I thought, how come a great company like Stuart Turner could make something that was wrong, I must be me at fault, as they are so great, they would never make a mistake or ten. So I double checked the parts to drawing, yes, I had made them correctly. So why didn't they fit? Oh! Dear, someone in the world famous ST empire must have had a slip of the pen and marked up the plans incorrectly, Oh! and someone must have forgotten to proof read and test the drawings, FOR OVER 10 YEARS!!!. I just wonder how many pairs of these big ends have been made over the years, and how many have had to be remade, just like I will have to do, and how many people must have complained about it, and how long would it have to be before ST put the plans right. Plus maybe reimburse the poor newbie for the wasted man hours and materials, not. It is my own fault, I know how bad Stuart Turner casting sets and plans can be, I should have checked and quadruple checked beforehand. Stuart Turner used to have a great reputation, and their collection of unique casting kits is second to none, but ever since going thru a few changes of hands, things have gone thru a few changes, in my mind for the worst. 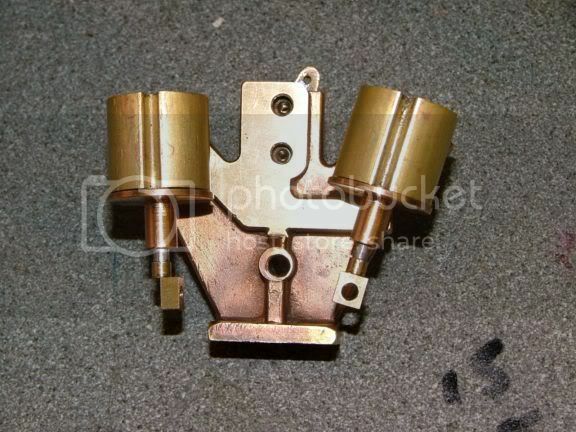 Quality of the castings have got worse and prices have jumped up beyond what they should have done. To me now, they are being made down to a price, and being sold for above market rate. Maybe not too bad for the larger and more expensive in the range, purely because they will most probably be using old stockpiles of castings, but any of their usual high throughput stuff, I personally would worry about what I was buying. I have had numerous people talk to me about rescuing ST castings, mainly because the castings were actually too small for the dimensions given on the plans. 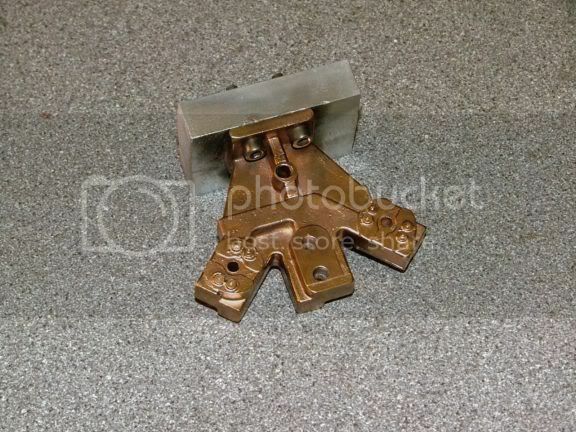 This suggests to me that rather than using proper oversized patterns that allow for the shrinkage of metals after being cast, they are using original castings as the patterns, so that when cast, the molten metal then shrinks away from the correct sized casting mould and they then come out say between 3% to 6% undersized, depending what metal is being used. This doesn't usually cause a major problem to someone who has worked or is working from castings and has a lot of experience, as they can usually see what is needed and swap a few figures about and get things to fit. Stuart Turner expect everyone that makes their engines to do just that. Make it fit. 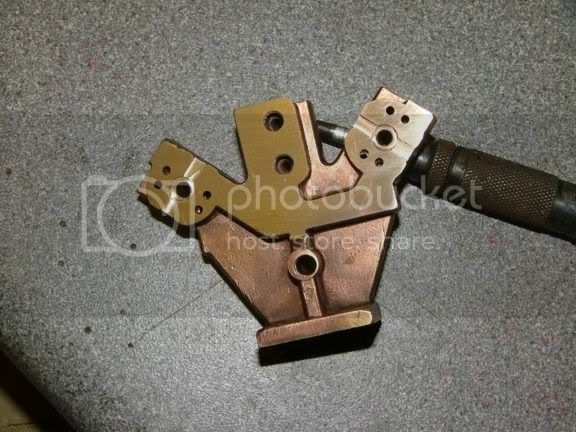 But it is a totally different thing when a beginner to casting work gets a set of undersized castings. 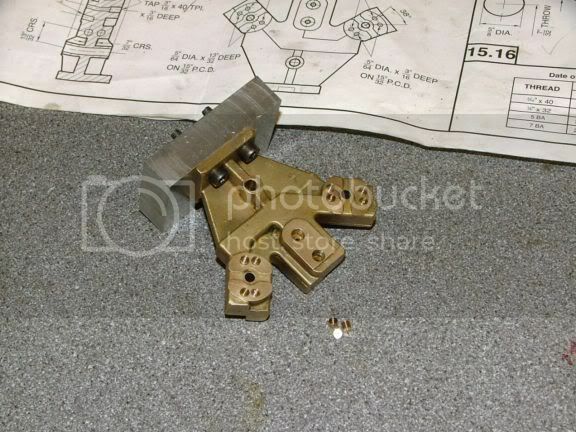 He doesn't understand that the castings have to be measured up first, before doing anything else, and then cross referenced to the drawing dimensions (and as I have shown, the drawings aren't all that good either) just to double check that the part can be made out of the casting. 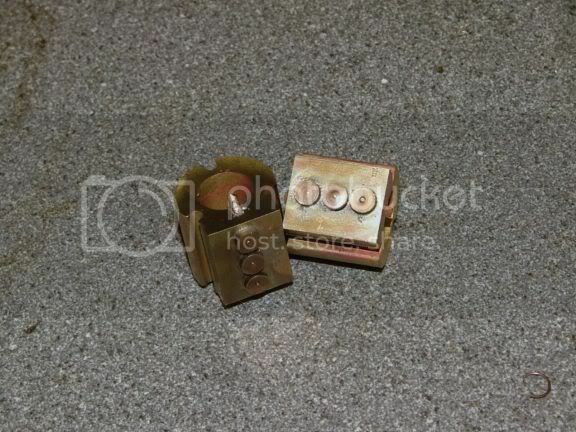 Usually, if the casting is undersized, after taking the initial cut, the engine is doomed to failure. Stuart turner are not the only ones on the money making roundabout. Reeves, who have most probably the largest casting collection in the world, have started to go downhill on quality, to such an extent, I personally would only recommend some of their castings being used as high priced fishing weights. You pays your money, you takes the chance. I got a new pair of big ends made, with the holes in the correct place this time. By the time I had finished working them, the ali bronze had gone rock hard, and I had trouble dressing the burrs off them. Just what is needed. 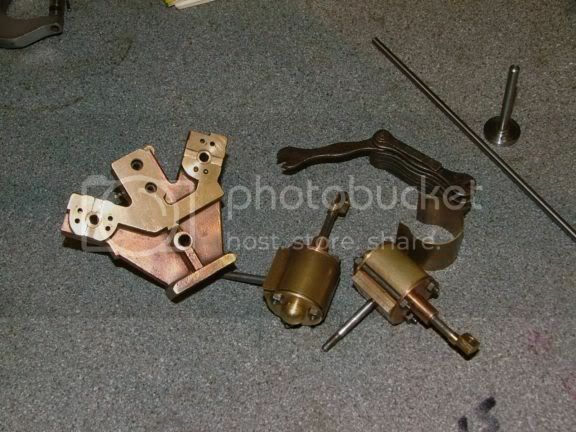 The next job to do was to get the tensioners made and sorted for the other side of the engine. New spring holders and knurled nuts were made up, these just need a set of acorn nuts making to lock everything up when the tensions have been correctly set. 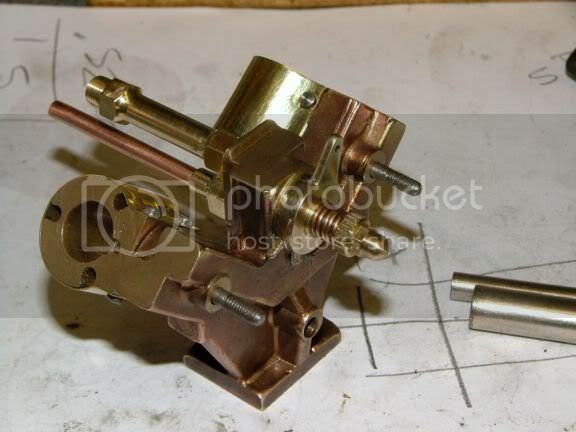 This shows the throttle valve area. No instructions for making the stop or setting it up came on the plans, so using my experience on what is required, I fitted a stop pin, and dressed the throttle stops. 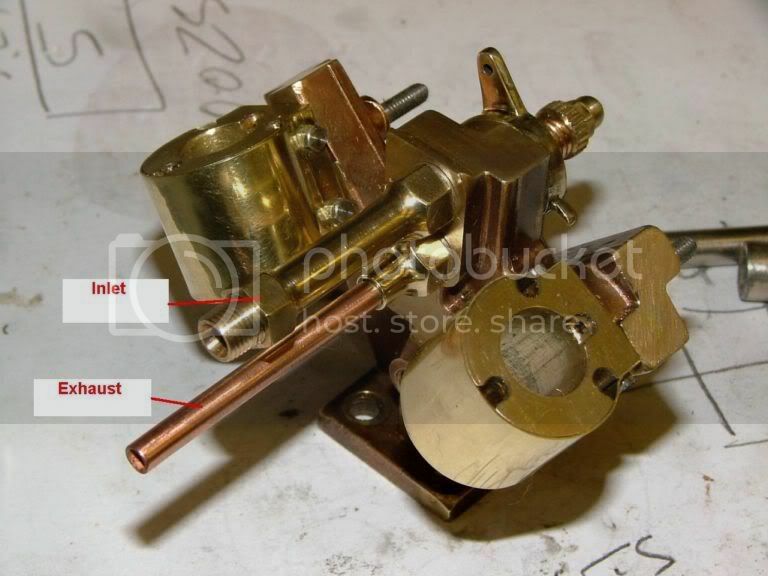 This is so that when in the fully one way position against the stops, the horse shoe cutouts in the valve face align perfectly with the port holes drilled in the main block, so depending which way the valve is swung, either fully fwds or reverse is obtained, and variable throttle and stop is obtained between the two. Now that I had the port faces being pulled against each other, and putting the big ends in their running positions, I could dress the the face of the crank disc to give a little running clearance. I gave it 0.020" (0.5mm), which should be more than enough if ever the cylinders get blown off their faces at an angle because of excess steam pressure. Now that I had all the bits set up for correct clearances etc, it now warranted setting up the RT to do a little offset drilling. Waiting until now meant I only had to set up the RT just the once and get all the bits done at the same time. This is now the time to show that accidents do happen to the best of us, and this was because I broke one of my golden rules, NEVER RUSH TO GET THE JOB FINISHED. The wife had stuck her head out of the door and shouted 'lunch in ten minutes'. I was just making the knurled nuts that are shown above, and being a smart a**e, I thought I could get them finished in time. 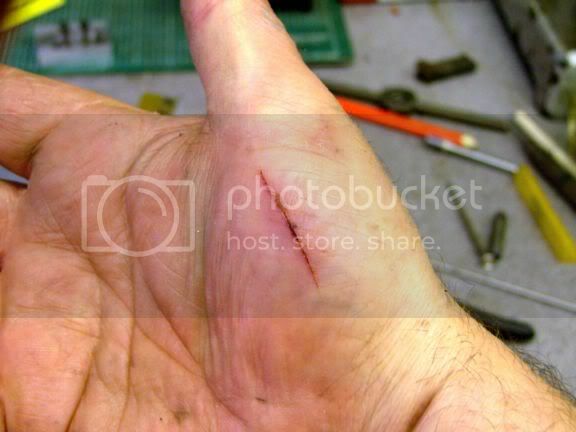 So instead of taking the small drill out of the tailstock and putting it back in it's box, by rushing, I forgot to do it. 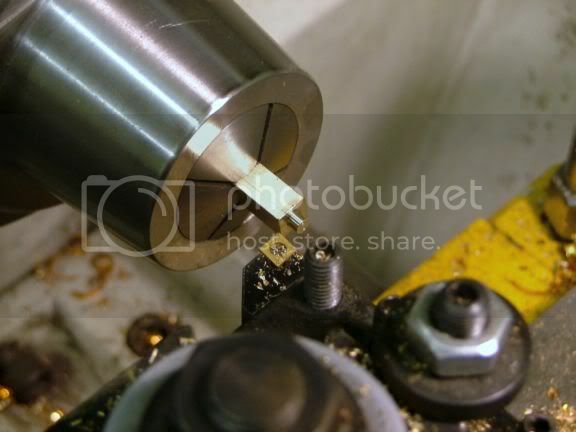 Swung away with the toolholder to change for the next one, and this fleshy and tender part of my anatomy dragged against the razor sharp edge of the drill still in the tailstock chuck. Ending up as a rather deep cut, any deeper and the sewing machine would have had to come out. The dog learned a few new choice words, the cat did a runner because it knows what happens to my boot when I am in a bad mood, lunch was delayed, as the wife patched me up and patted me on the head as though I was a little kid, and I lost the rest of the day in the shop, while I waited for it to stop bleeding and heal up. All because I acted stupidly in a dangerous environment. Anyway, enough of my stupid antics, back to the job in hand. 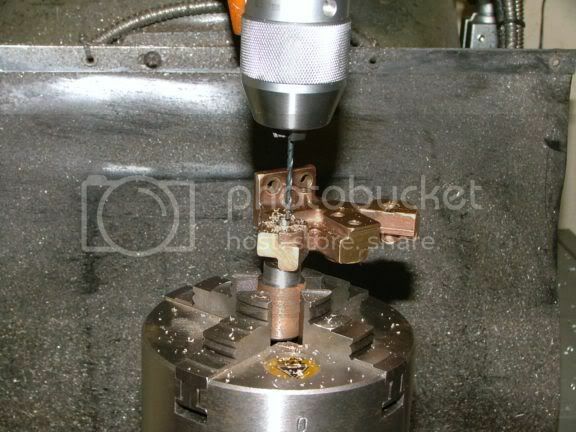 The RT was centred up, offset in the Y axis for the drilling for the pin in the crank disc. 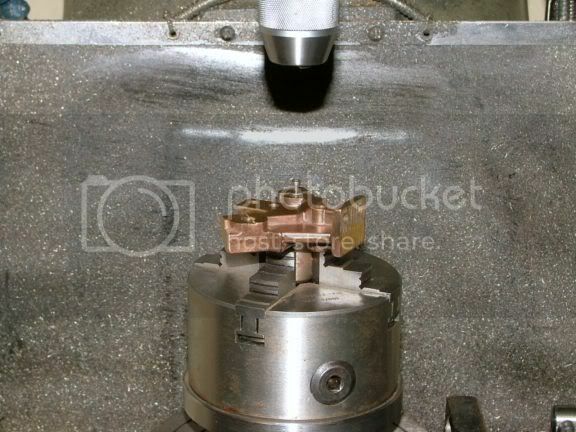 Notice that it is sticking up from the chuck jaws a bit, this saves drilling into the chuck jaws as you break thru. 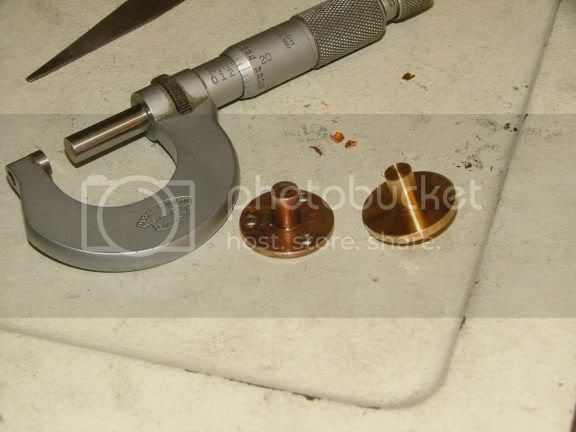 Next offset was for drilling the holes in the bottom cylinder bearings. Because I didn't want to drill into the chuck jaws, I put a couple of washers underneath as the jaws were tightened up, just to raise it away from the jaws slightly, so as the drill broke thru, no damage would be caused to the jaws. The washers are removed before starting to drill. The same offset was used for the top caps, but thinner washers this time. I didn't have as much to hold onto with the chuck jaws. I was just a little more careful as the drill broke thru. All bits drilled, and the washers lived to be used another day. Now these bits have been finished, it allows me to progress a little further and get other parts that have been made previously, fitted onto other assemblies. The engine is now going together rather than having fixes done on it. 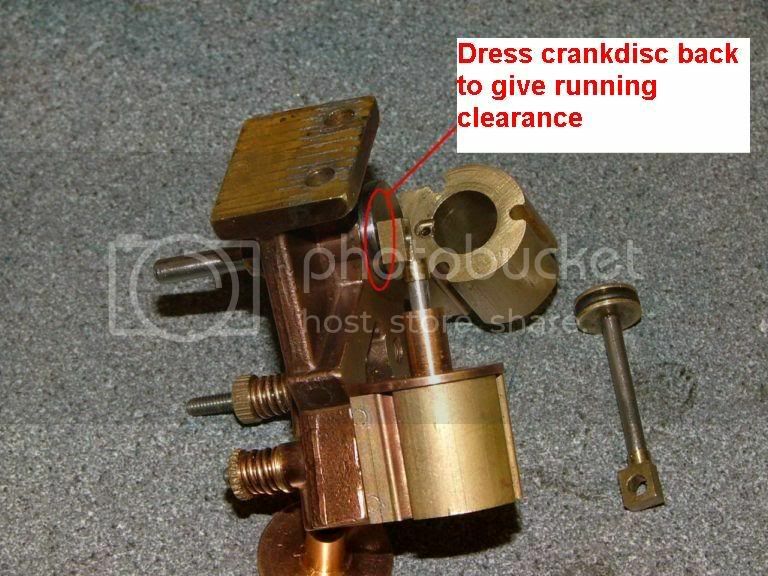 Today it was the time for the crank, and I think that this post might be of use to a few of you who build small engines. This shot shows a normal crank build, and to me is one of the worst types. What should be done, drill a slightly undersized hole, wack a pin in and hope it goes in straight? 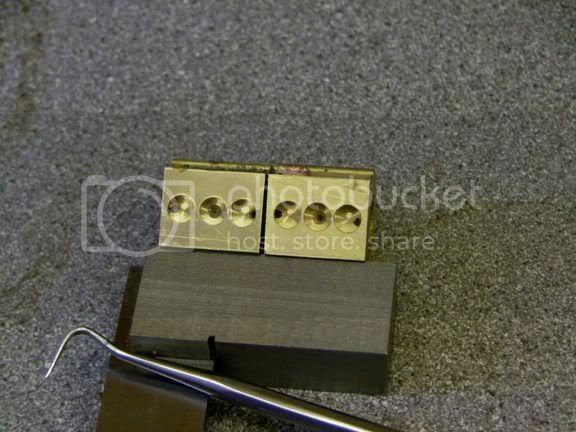 Or make a slightly oversized hole so that you have clearance for silver soldering, wack the end of the pin to deform it so it holds in the hole whilst soldering, and again hope it ends up square? There are many ways of doing it, but I will show you how I go about it to almost guarantee that the pin will be square and secure in the hole. First thing I do is thread the hole, to about the same size as the normal plain hole. 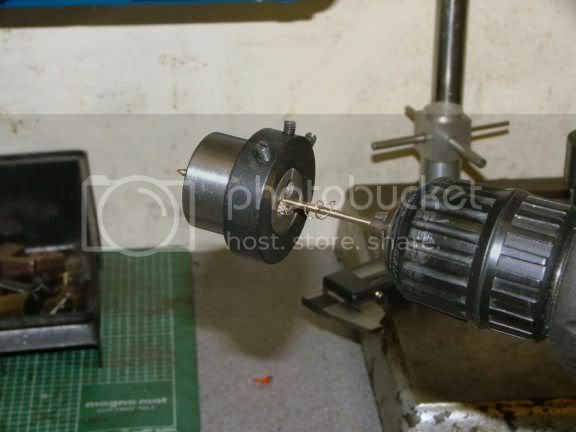 Then I turn the pin up out of silver steel (drill rod) that is rather larger than the original sized pin. 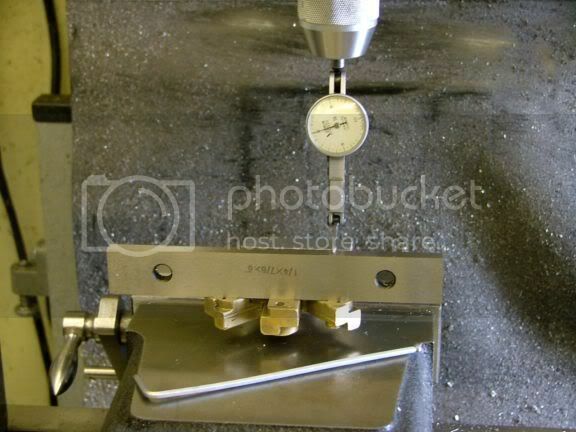 First off you turn the length and size of the crank pin you want to go thru the big end. Make sure you end up with a nice clean shoulder where it joins to the main bar. Then cut a length off the rod to allow you to form the other end. 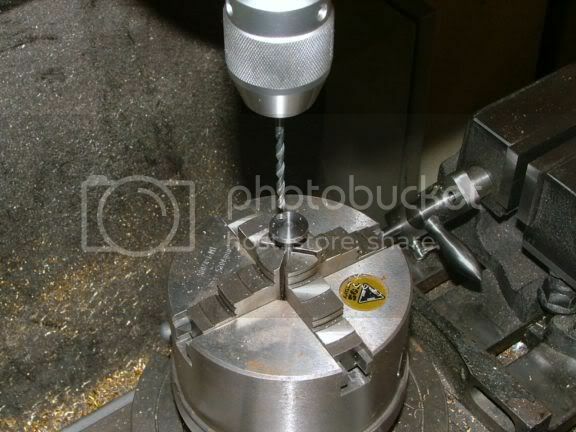 Holding the crank pin in your chuck, you turn down the sticking out end to the size that is required for threading, and while you are doing that, form another shoulder, like shown. My integral 'washer' is about 0.025"(0.6mm) thick. Then thread the stub to whatever size that is in the crank disc. Turn a small undercut on the thread, to ensure it screws all the way into the hole. 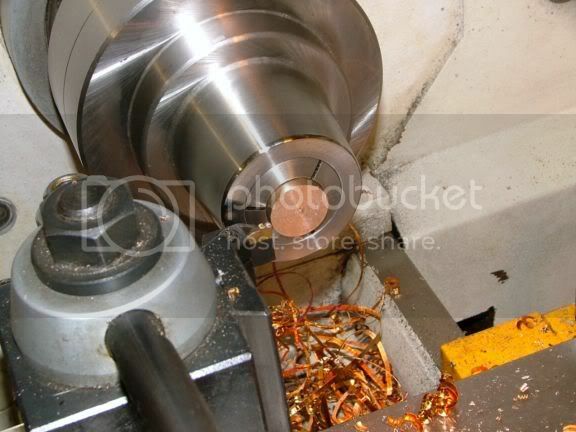 After that, turn down the diameter of the 'washer' so that it doesn't overhang the edge of the crank disc. A little high strength loctite on the thread and it is then screwed into the hole tightly. 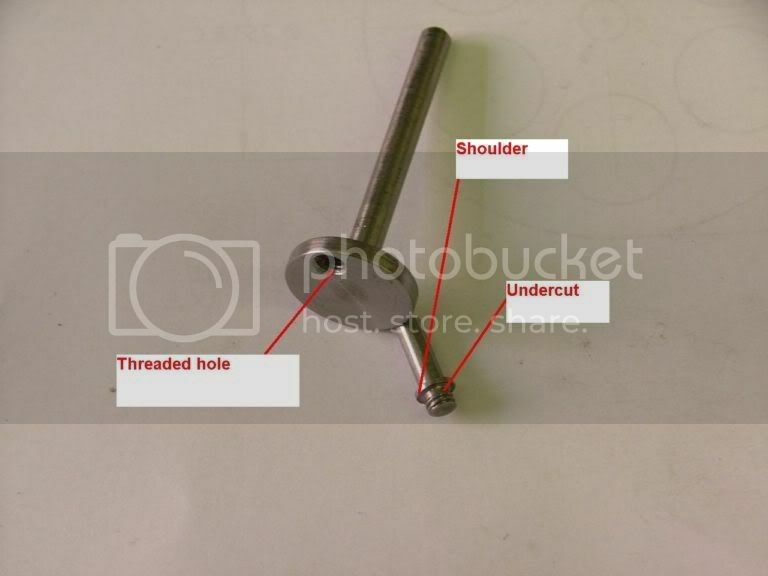 The small shoulder will ensure that the pin ends up perfectly square to the crank, even if the hole was tapped slightly out of square and the thread isn't too tight a fit. Dress off the back of the hole so the thread is flush, and put one or two very small pop marks around where the thread and hole meets. 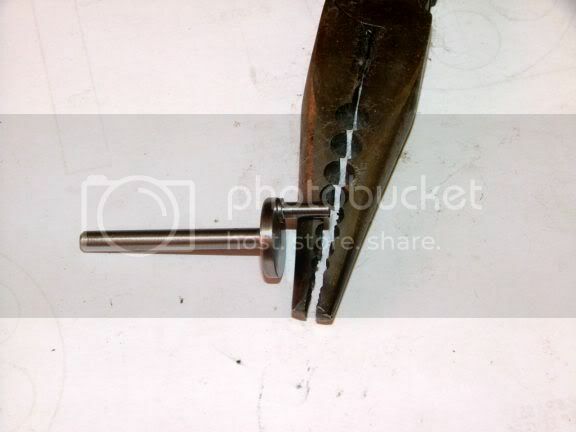 If ever the pin gets worn, a good grip with a pair of pliers or vice grips and you should be able to screw it out, make a new one and refit it. When I made the basic crank and disc, I made on the back of the crank disc a 'rubbing face' to reduce friction, I left it overly long because I didn't know how thick my 'washer' would end up being. After the pin was made, I reduced the rubbing face by the thickness of my washer. So now everything has nice small running clearances. But those damned big ends came back to haunt me yet again. When I tried to turn the engine over by hand, I was STILL getting interference, even though they were made to the modified drawings. The pic shows what I eventually had to do. Hack the corners off. Then the engine turned over very nicely thank you. I just couldn't resist it, the basic bits for the engine were there, no gaskets or cylinder outer covers, so I wacked some oil into and gave it a small dose of air. It ran like a swiss watch, both forwards and reverse, and the throttle works a treat, and that was with a tight engine, when it gets bedded in, it should run on a wisp of air (or steam). Drilled the cylinders, marked up the covers for drilling and shortened some small headed 8BA bolts to hold them together. All bolted up, and couldn't resist a bit of bling. I also knocked up new inlet and exhaust pipes, the original ones were terrible. It just so happened, they brushed against the buffing wheel by themselves. 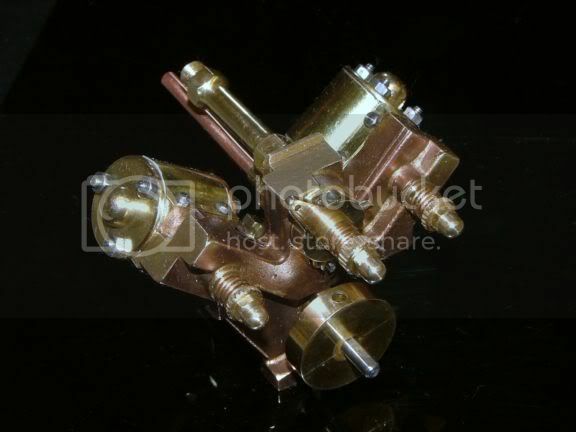 The control valve casting did the same thing. Time to make some PTFE cylinder gaskets. The customer also wanted to know if I could make him an oil and water trap. Back of the assembled engine. I finished off the oil and water trap as well. And just to prove that a scrapper can be brought back to life. I hope you enjoyed this little journey and maybe picked up a few tips you can use yourselves. Re: Restoring a very badly made engine. as always john that was a great read, i have some of my own models i built many years ago that need some of this work done to them. the finished engine look super and runs real nice. What a transformation John. And a great read too. Maybe it should be renamed the Phoenix...rising from the figurative ashes to a blaze of glory!! Abeautiful result and fine runner. It does go to show that a worn out engine is still usable long after you think it is dead. All it takes is a bit of patience and ability. 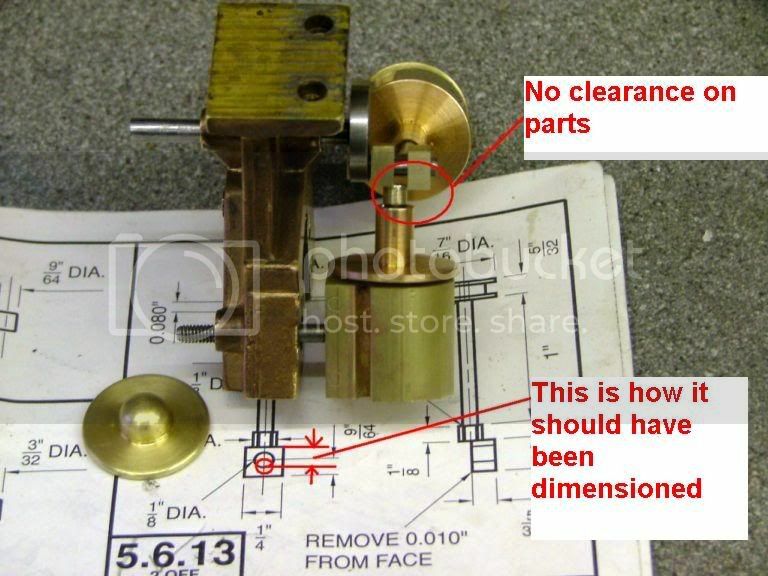 Many thanks John, I have a single cylinder version on its way for repairs so this has come at a perfect time and gives a great insight on how to fix others blunders. Great documentation and restoration on the engine. It looks like jewelry now. I have one of those projects sitting in a drawer somewhere that was given to me at a show. Like yours it has so many issues I didn't even want to start on it. As you mentioned in the beginning this will definitely help out anyone contemplating a restoration project. Glad to be of assistance Frazer. It was not meant to be shown as a build project, but a series of little fixes just to show how to repair certain normally encountered problems. George, I have had many such engines through my hands, and it is one aspect of the hobby that I just can't put down when I start. I only charge for any raw materials used, otherwise if I charged for my time, it would just be too expensive for people to afford, in fact way more than the cost of the original casting sets. I usually end up putting a lot of little necessary extras on the engines, just to improve their running, as a lot of these sorts of engines were never really designed to be much good, and just by using good engineering practices in places can really make them sing. Thanks for reposting! These recycled topics are very much appreciated. The wealth of information and tips gleaned from your articles are priceless. Please do continue to share your past projects with us. Anything you post is a must read for me. 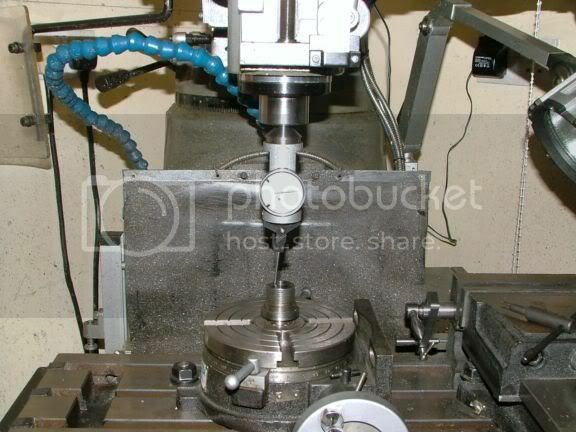 Is there a chance that “Fixing Daren’s Lathe” could be reposted? 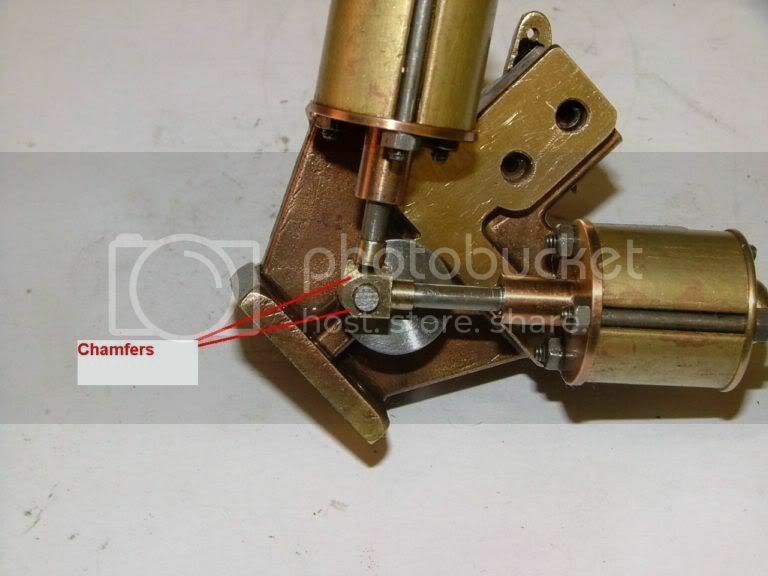 That was a gem, and would be a great resource for all the mini lathe users out there. I'd just like to echo what others have said - this was a great write up. I leaned many things to file away for use later. The whole process was just fascinating to see how you got around each issue. Thanks for taking the time to write it and share it (twice apparently , though this is the first time I've seen it). 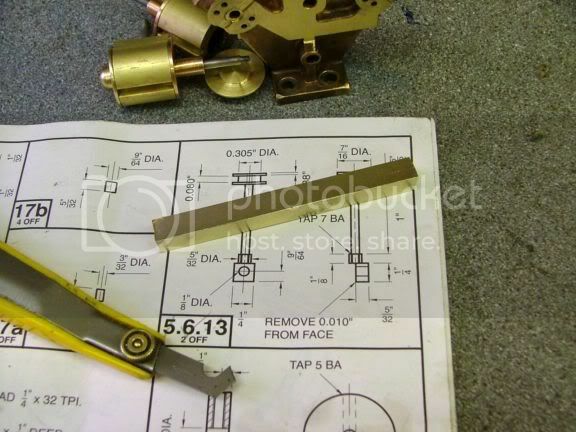 I contemplated restoring the Darrens lathe post, but with around 200 photos and related text to be edited to modern day standards and brought back into synchronisation would just be too much for me to try to do at this time. Little would you believe it, this one took me nearly 3 hours to repost, and I reckon the lathe one would be around 10 hours. What a splendid read John. Thank-You. It held my interest from start to finish and took me a good hour to get through. 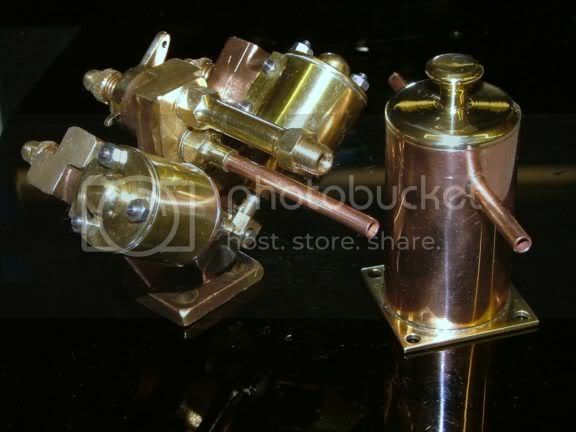 I have one of the Coles's version of this engine in my stash and I am sure that the techniques you have illustrated for us will go a long, long way to getting it finalized, one of these millennia. Beautiful work as always. No problem; I quite understand. I, can imagine the time it takes to put up an elaborate build, or in this case a repair thread. To take the time to do it over and re post it is truly commendable. I guess we just want you to understand how much we appreciate it. Thank you John. I had never seen the original of this post. As always I learned a few things from it. When reposting something, it isn't the pictures that take most of the time, they just need to be renamed. I have to read every word of the text and bring it up to date, as on the original text I might be replying to someone who none of you know, plus also make sure that some things are inserted that might have been done as personal reply to an individual, otherwise things would not read correctly and could cause even more confusion. To put it bluntly, the basic text is there, but it needs updating somewhat. So if you do see about other posts that I have done (but not too long) that you think might be of help to be reposted, then do bring it to my attention, and I will see what can be done. Very soon, I shouldn't need to be doing any reposting at all, as my shop will soon be ready for me to start work again.